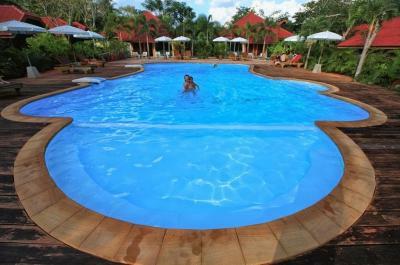 Lock in a great price for Green View Village Resort - rated 8.3 by recent guests. The environment was very calming and it was a different experience altogether. The staffs were very friendly, helpful and efficient. The rooms were spacious. They provided free transfer to AoNang beach every one hour which was always on time. The tour packages were extremely reasonable and cheaper compared to what is offered by other tour agents. The location was also somewhat strategic as it is just a walking distance to an array of restaurants. The flowers, the jungle, the trees and little lake. Amazingly beautiful. Nice pool. (s) The big entrance and eating hall. So close to ao Nang Beach. And quiet all day. Good spot to relax! When u book a boat tour I'll be the last one get picked up and the first one dropped of mostly. Coz it's near to the pier. Very comfortable. I had a lovely stay. 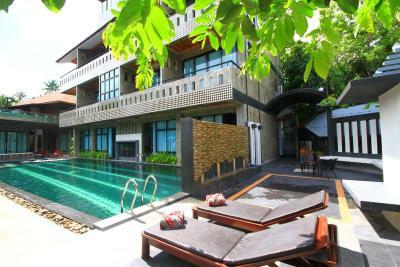 Must stay here again and excelent value Location great and bit too far from the nightlife. Clean rooms. Great Wi-Fi. Friendly professional staff always ready to help. Breakfast wonderful. Free baht bus to beach (5mins) Swimming pools Superb. Close to excellent restaurants and street food. View from my room was amazing and felt I was in a jungle paradise! 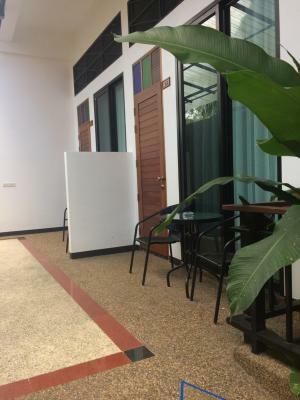 Hotel was clean, rooms confotable, great Wi-Fi, location great with free baht bus going to beachfront every hour from 8am to 8pm. Breakfast was ok but get there before 9am. The two pools were very clean and nice with a great view of the mountain. Rooms at night very quiet as away from fun nightlife on main road. Superb stay and really must stay there again. Staff was super friendly! The breakfast was descent! Everything was clean! In addition we want to change a room from double twin to a room with one double bed and they moved us to a room with double bed which was better than the one we have booked and they didn't charge us anything more! There is also a route to the beach which take place every one hour without charge! Located off muslim street which is a bonus. Night market and halal food stalls. 3rd time here and it only gets better. The best hotel, the breakfast was amazing, the staff friendly and clean. Family friendly rooms. Awesome pool. Great location. 3rd time at Green view within 5years. The beautiful pool, excellent breakfast, friendly, helpful staff. 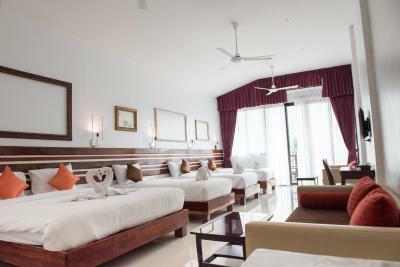 One of our bestsellers in Ao Nang Beach! 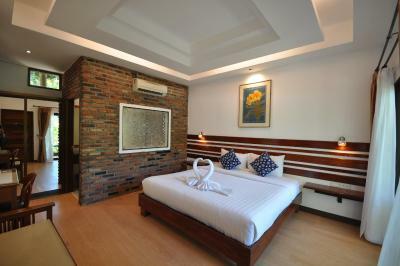 Featuring individual bungalows set in tropical landscapes, Green View Village offers accommodation with free WiFi in the guestrooms and free parking. 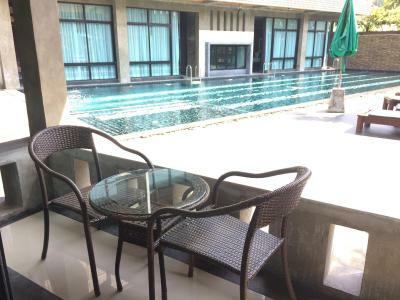 It has an outdoor pool and shuttle service to Aonang Beach. 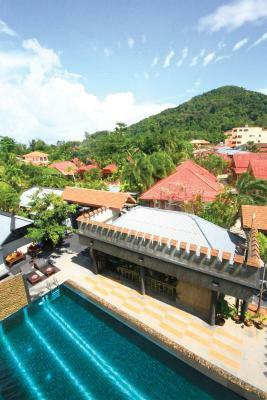 Green View Village Resort is a 2-minute drive or a 15-minute walk from Aonang beach. 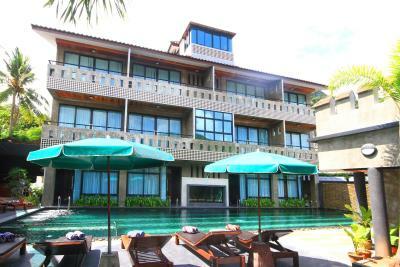 It is a 30-minute drive from Krabi Airport. 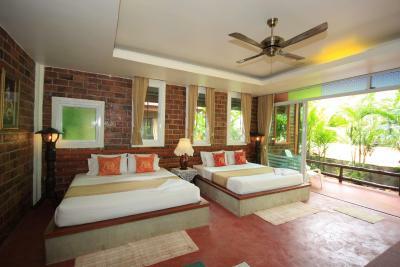 Surrounded by greenery, all rooms at Resort Green View feature a balcony except certain room types with pool access. Each room has a seating area and an en suite bathroom with heated shower facilities. Most rooms have a fridge and TV. 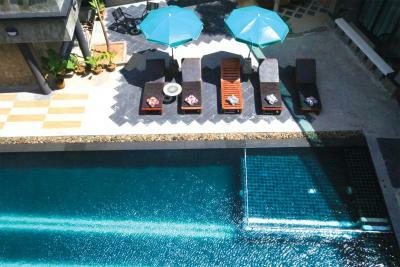 Guests can lounge by the outdoor pool, which features views of limestone mountains. Staff at the reception desk can offer information on trips. Outdoor dining with a range of Thai and international dishes is available at Green View Village’s restaurant. 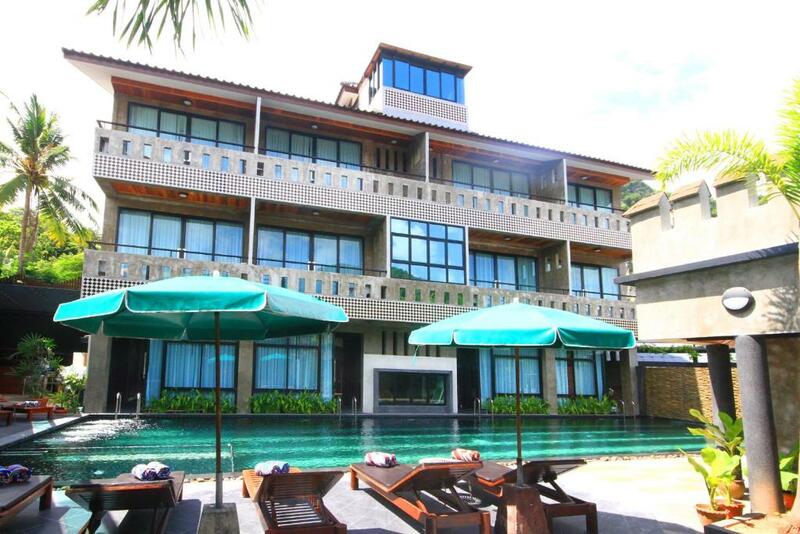 This property is also rated for the best value in Ao Nang Beach! Guests are getting more for their money when compared to other properties in this city. 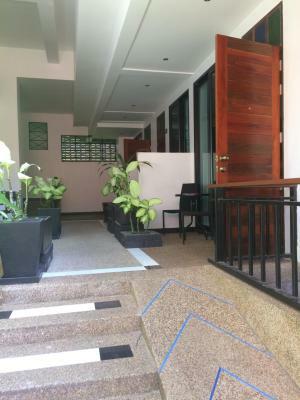 Green View Village Resort has been welcoming Booking.com guests since 4 Nov 2010. 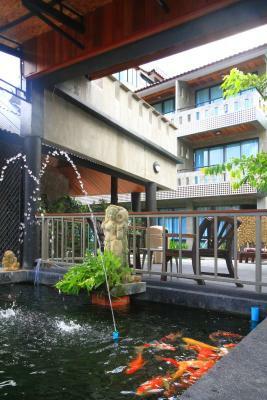 When would you like to stay at Green View Village Resort? Features a private balcony with a seating area and an en suite bathroom. Includes a fan and a mosquito net. This bungalow comes with a cable TV, a safety deposit box and a fridge. Its en suite bathroom has a shower. Features direct pool access and seating area with sofa set. It also offers a mountain view. Features views of the tropical garden from the private balcony. 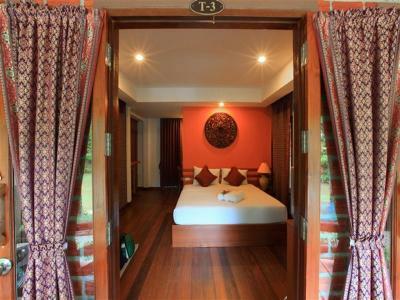 Traditional Thai-style villa features wooden furnishings and garden views. Situated on the 2nd and 3rd floor, the cosy double room comes with views of the mountain and pool from its private balcony. It also includes a sofa and an en suite bathroom with a rain shower. 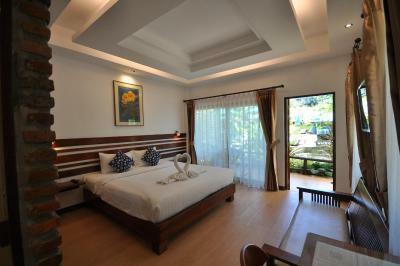 Situated on the 2nd floor, this triple room offers views of the mountain and pool from its private balcony. The en suite bathroom includes a rain shower. Featuring a direct access to the outdoor pool, this double room is fitted with a cable TV, a sofa and a private bathroom with a shower. 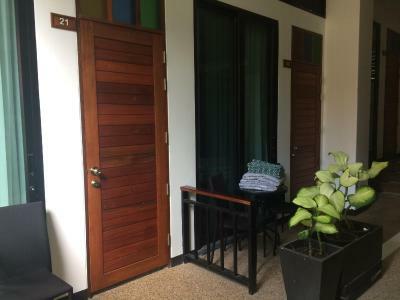 Located on the ground and 1st floors, this room type comes with a private balcony and an en suit bathroom with adjustable shower. House rules Green View Village Resort takes special requests - add in the next step! One child under 12 years is charged THB 150 per person per night when using existing beds. 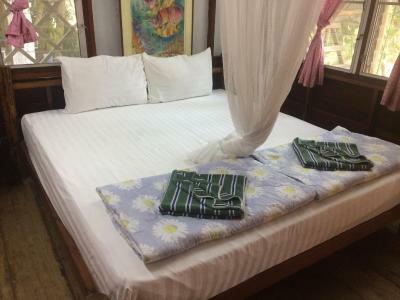 One older child or adult is charged THB 600 per person per night when using existing beds. Green View Village Resort accepts these cards and reserves the right to temporarily hold an amount prior to arrival. The pool could have been cleaner. Our bathroom had stagnant water near the sink and it was quite a mess as we go in and out the bathroom. Breakfast was good but it was almost the same menu during our stay. We wouls have appreciated more varieties. Breakfast had only white bread no healthy bread and juice is super sweet and not 100% juice. The rest was tasty. Everything was ok! I don't have to add anything negative!